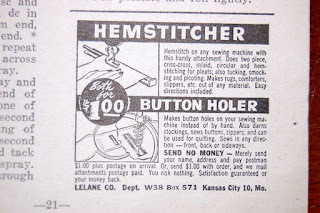 Take a look at the 1948 advertisement - get the hemstitcher AND the buttonholer for only $1.00! 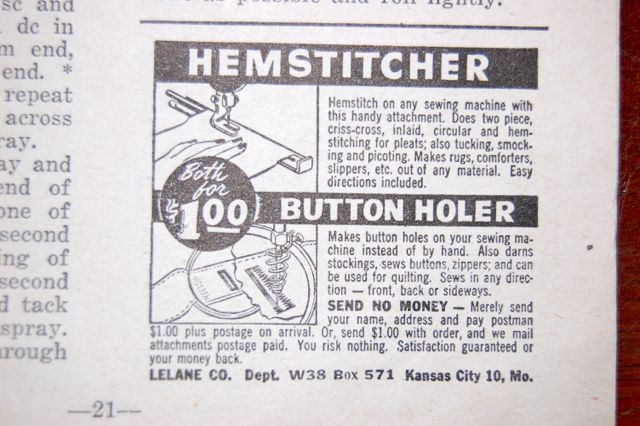 I have seen quite a few of these vintage attachments and LOVE them! Fashions certainly do come and go - AND return many years later. I love my fingerless gloves and wear them inside and outside. Got my yarn and ready to crochet myself a pair from the 1948 pattern. In craft heaven tonight. Just received over 100 Workbasket magazines. 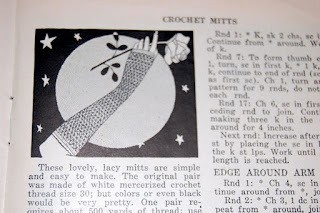 They are filled with crafty items to crochet, knit, etch glass, paint fabric, sew, and more. They were printed "for pleasure and profit". They were to help women make a bit of money at craft fairs and bazaars. So far I am still in 1948 issues. Have all the 1950s to go!